Located on the western edge of the Sydney CBD, Barangaroo is the largest urban renewal project to take place in the city since the 2000 Olympics and is one of the most significant waterfront transformations currently underway in the world. With sustainability the key focus for the development, architects and developers have incorporated smart building design to ensure higher performance and efficiency than regular developments. One of the ways this has occurred is by constructing a 77,000sqm basement beneath the Barangaroo South precinct to hide the building services. Barangaroo spans 22 hectares along the Sydney harbour and is split into three development areas: Barangaroo South, Barangaroo Reserve and Central Barangaroo. In December 2009, Lendlease was selected by the Barangaroo Delivery Authority to develop the Barangaroo South precinct, which covers the southern 7.5 hectares of Barangaroo. It will become home to around 1800 residents and 23,000 office workers, and is expected to attract around 18 million visits per year. The estimated end development value is $8.7 billion. Formerly a container wharf, the site has been closed off for generations, but a world-class team of Australian and international architects are changing that, with over half the site and the entire 2.2km foreshore to become publicly accessible. Once the precinct is complete, it is set to be the greenest and most advanced financial district in Australia, with the most sustainable buildings in the world, and will have a mix of uses, including commercial, retail and dining, as well as a new hotel. Hiding underneath the Barangaroo South precinct lies a 77,000sqm basement, designed to allow the area to maximise sustainability outcomes while reducing costs. 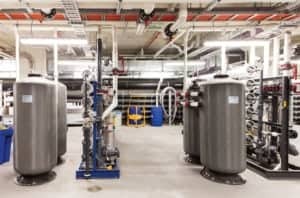 This basement contains everything from a cooling plant to water treatment facilities, and is a prime example of how to implement less obstructive utility rooms. James Peterson, Head of Operations for Barangaroo South – Lendlease, was part of a diverse design, development and construction team responsible for bringing the basement to life. “We wanted to create something that was an example of global operational best practice in terms of its ability to leverage scale to run more efficiently, and removing duplication, whilst creating an exciting place for people to live, work and play,” Mr Peterson said. There are hudreds of rooms in the basement servicing security, cleaning, plant and pump operations, and retail. Two of the major utilities located in the basement are a district cooling plant and a recycled water treatment plant. Air conditioning systems in commercial buildings typically rely on cooling towers located on the roof. These consume an average of approximately 20,000 litres of water per day. 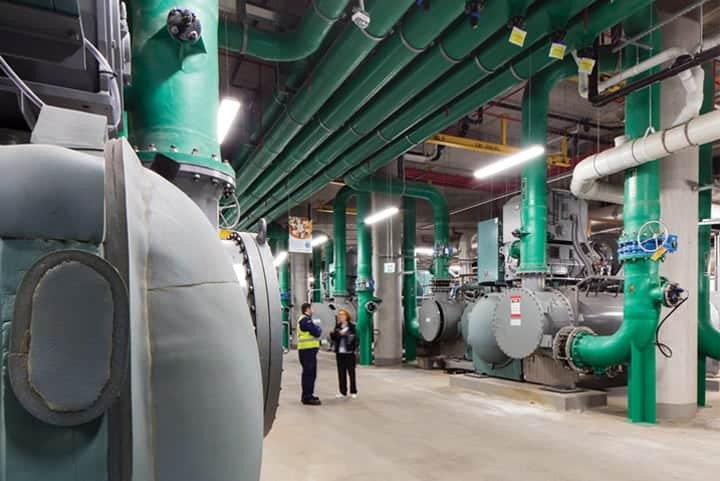 Peter Flynn, Development Manager, Infrastructure, Barangaroo South – Lendlease, said, “At Barangaroo, we utilised the scale and location of the area — on Sydney Harbour — to develop a ‘harbour heat rejection system’ for the central district cooling plant (DCP) in the basement. “Using harbour water saves the precinct about 100 million litres of water per year, while freeing up the rooftops for solar panels. The chillers, which are arranged in counter flow pairs for added heat transfer efficiency, provide cooling to a primary chilled water loop operating at 4.5°C. This then reticulates cooling though the basement to energy transfer stations at each building. The cooling is transferred to secondary chilled water loops in each building via heat exchangers which also act as pressure breaks. In turn, the chillers are cooled directly by water pumped through their condensers from the seawater pumping station. The recycled water treatment plant is capable of creating more water than the precinct uses each day. All black and grey water is taken through mechanical and chemical process to convert used water into high-quality recycled water used for toilet flushing and irrigation. “The recycled water plant is built on membrane bioreactors which use natural biological processes, including cultivated bacteria, to remove nutrients from the precinct’s sewer flows. The resulting water is disinfected and filtered for reuse,” Mr Flynn said. “The plant has the capacity to treat all the sewer flows in the precinct, as well as additional sewage drawn from external mains. 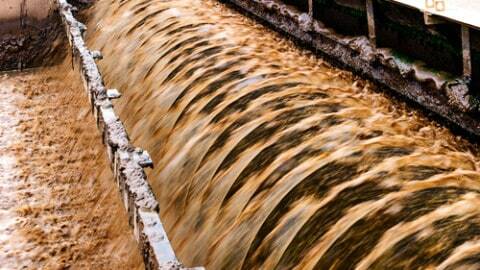 These flows can be treated to a standard suitable for toilet flushing and irrigation. 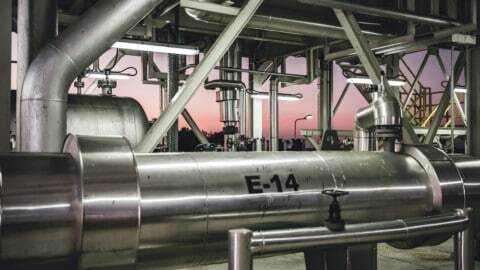 With such a large-scale project, a great amount of equipment needed to be procured, including pumping systems. “It would be many hundreds. 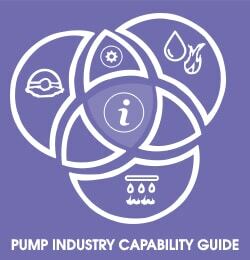 We buy pumps as parts of systems, rather than on their own,” Mr Flynn said. “There was not one simple process for procuring the pumping equipment. Some elements came as part of system-based packages, others via installation subcontractors and the rest are purchased directly. “Procurement decisions are based on the best risk mitigation and commercial considerations. We always assess the application, including whether it’s specialised, if there are suppliers with experience in this application and the technical risk associated with the application. 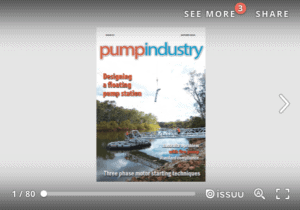 Mr Flynn said there were three crucial factors when selecting the pumps: they needed to meet minimum duty requirements, minimum efficiency requirements, and have a positive track record of operation in similar technical applications. After those criteria are met, cost comes into play. Energy efficiency was also a key concern as the project aims to be awarded the highest available Green Star and NABERS ratings. “Being part of a precinct aiming to be carbon neutral, the energy efficiency of the pumps was crucial. Almost all pumps in the precinct operate on variable speed drives to manage power draw. A minimum efficiency level is set for each specified pump, and these must be met to be part of the basement,” Mr Flynn said. Mr Flynn said given the scale of the basement, which includes a two-level dock for trucks, it provides much better accessibility to the pumps, and other equipment and facilities than a typical CBD building. Other facilities located in the Barangaroo South basement include a centralised security control room and operations room, loading dock, mailroom, and waste and recycling facilities. The Barangaroo South project is expected to be completed in 2023.